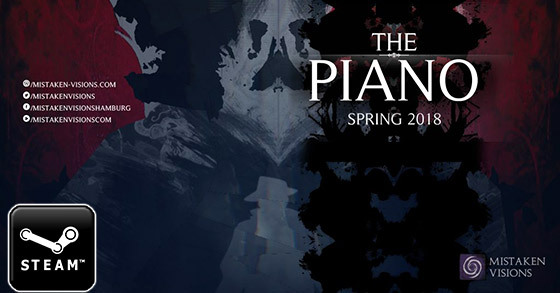 Via a brand new trailer, Hamburg-based indie developer Mistaken Visions has announced that its noir-influenced horror game, The Piano, will release on 24 May 2018. The Piano has been five years in the making, predominantly by one developer, Jonathan Stemmildt. His aim was to create a different kind of horror game: one inspired as much by film noir as by Silent Hill, and whose adventure tells players a deeply personal and intimate story. Jonathan Stemmildt said: "Five years ago I had the idea of making a horror game that wasn't just about the scares, but which featured a deep and personal story that players could become emotionally invested in. It was my first game and I never really expected much to come of it - but suddenly, something I dreamed about for years is becoming reality, and time is just flying by. It feels great!" The game is being released in partnership with indie game consultancy Game If You Are, whose director Lewis Denby said: "I first discovered The Piano 18 months ago. When Jonathan sent me an early demo, I found a game that had an atmosphere and personality unlike anything I'd ever played before - and since then, Jonathan and I have kept collaborating on occasion, slowly nudging it towards completion." Lewis, who is also producer of The Piano, added: "It's been great working together, and I think the results speak for themselves. Together we've taken Mistaken Visions' already extraordinary work and started adding that extra layer of polish. We can't wait to see what people think of the game when it releases next month!" The ambitious indie horror game - which features around 8 hours of unsettling adventuring and a fully voice-acted cast of characters - will release for PC via Steam on Thursday 24 May, priced at $9.99.